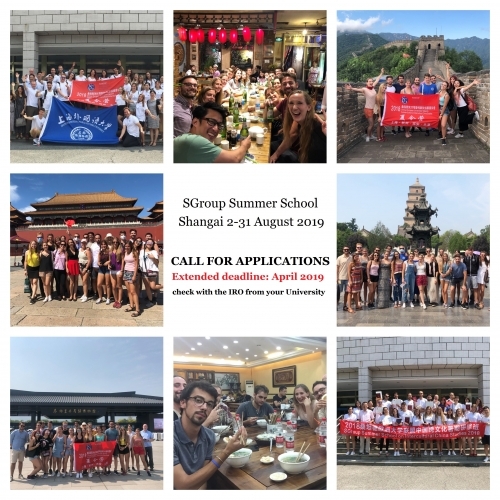 The call for applications for the second edition of the SGroup Summer School on Intercultural China Studies in Shanghai is now open! The event will take place at the Shanghai International Studies University between 2-31 August 2019. The programme provides for inspiring lectures in all important aspects of the relations with China: Chinese culture and tradition, economy, diplomacy, and language training. It is designed as a capacity building initiative for students considering exchange programmes with China or, in a longer perspective, undertaking professional activities in this region. Lectures and language classes will be delivered by top experts in their respective fields from Europe and China. Apart from formal classes and language training, students can experience immersion in a number of cultural and social activities intended to deepen the understanding of China, such as movie nights, tai chi classes, tea ceremony and multiple excursions of their choice, for example to Hanghzou, Water Town TongLi or XiTang, Xi´an, Beijing, and to the famous Great Wall. Students will be hosted at university dormitories of the Shanghai International Studies University (SISU) and assisted with local and European organisers who will help participants make the experience rich, memorable and fun! You can find a tentative programme (subject to change) in a downloadable form at the bottom. 1. After filling this form, students must send a motivation letter in English, CV, transcript of records and a signed (scanned) version of the Declaration of Commitment (below) to the Liaison Officer from their institution (the complete list of Liaison Officers can be found here). The application documents should be submitted to the LOs in the deadline defined by each University. 2. Liaison Officers’ should rank the applications from their Universities and send them to sgroup@sgroup.be until 30 April. The criteria for the ranking is part of the internal procedure of each institution, without any interference from the SGroup Executive Committee. 3. Candidates and institutions will be informed of the results by 6 May. 1.600,00 € per student (including tuition & accommodation for week 1 - 3 in Shanghai (1.200,00 €) as well as the inner Chinese travel expenses during week 4 to Xi’an and Beijing (400,00 €)). Please note that SGroup does not assure scholarships for this programme. Contact the IRO from your University to clarify any possibility of financial support. For further questions about the participation in the Summer School, students should contact the Liaison Officers’ from their Universities, which will liaise directly with the SGroup secretariat.